Greene County Chambers of Commerce provide their Members and communities with an opportunity to meet with their local representatives at our Annual Legislative Breakfast. 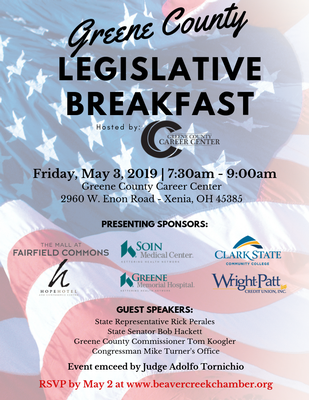 This year, the breakfast will take place at the Greene County Career Center on May 3, 2019 from 7:30-9:00am. All of our local representatives have been invited to attend.